An eye-catching stick that is suitable for everyday support. 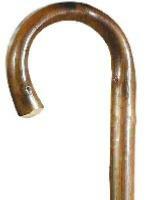 The shaft and handle have been scorched and polished to produce an interesting finish. Height 92cm (36"). Fitted with a non-slip black rubber ferrule.